Algaemy arose from research by-products: pigment extraction from algae. In experiments with the pigments, the designers discovered that the algae colours changed when exposed to sunlight and reacted with each other through overlaying. In this way they developed a biodynamic colour palette whose colours change over time. Blond & Bieber wished to make their research results understandable and palpable, and find application for them. For this they had to ascertain: what carrier materials hold the pigments and how do they react with them? Each step involved new experiments. Limited collections and prototypes arose in collaboration with fashion designer Ylenia Gortana and shoe manufacturer Trippen. 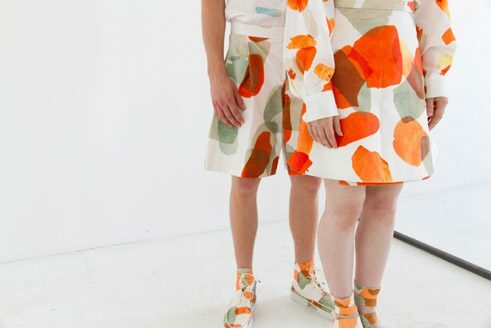 The design duo sees many application possibilities for their “algaemical” colour palette beyond the fashion world as well. For instance in interiors, furniture or upholstery in the auto industry, where chemical colours are becoming an increasing problem for allergy sufferers. Essi Johanna Glomb and Rasa Weber ask conceptual questions, such as the one about time. What if processes of development and change were to become visible in the products and the wearer’s clothing could be combined with his or her personal history? The product designers see themselves primarily as intermediaries between research and application. With Algaemy they won the Make me! Award 2014, Output Award 2014, Core 77 Design Award 2014 and Ecodesign 2014. Their new project, Sleep with Us, has been nominated for the German Design Award 2016. Ulrike Prinz is a cultural scientist, freelance author and editor.